I find that the older I get, the more I seem to turn to my window for inspiration. There are days that I crave sunshine and blue skies more than anything in the world. I don’t know what it is. But the warm golden sunshine just seems to melt away all of the stress and cobwebs that have a tendency to wrap themselves around me like a straight jacket. It can be paralyzing at times. Being all wrapped up in cobwebs and stress. 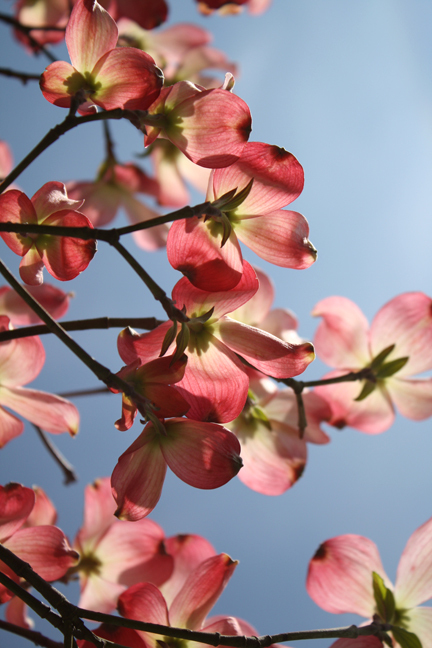 Last weekend as I was gazing out my window absorbing as much golden sunshine as humanly possible, I realized how stunning our dogwood tree was. What a sweet disposition it seemed to have. All of the cheerful blooms where bursting with color and looked as if they were gathering in celebration. A sunshine celebration. I stopped for a moment. Just a few weeks before this same tree stood barren. Just a trunk with branches. 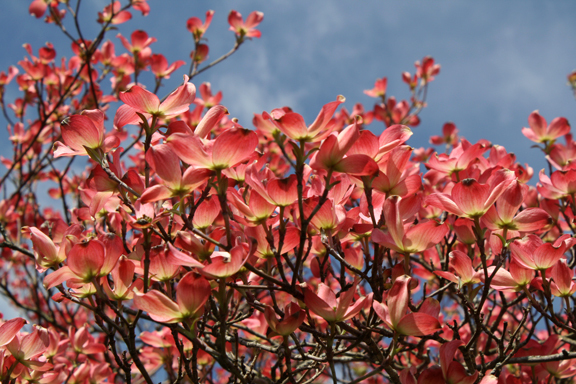 Pink, delicate petals dressed the tree in splendid attire. Not a trace of barren to been seen. as the golden sunlight danced amidst its blooms. I pondered that little tree for quite some time. It was so seemingly forgiving of the relentless Winter that had taken all of its’ glory away. It was amazingly unaffected by all of the cold rainy days prior. It was just relishing the moment. Dancing in the sunshine. Heads held up to the light. Last year I wrote about how this very same tree taught me to “Be Still“. So beautiful – thank God for spring!! omgosh! those pictures are amazing!! Spring and I hate a love/hate relationship..love the warmth and colors and flowers…HATE the pollen! The post is inspiring..you made me smile! What a beautiful tree! and the pictures are awesome!. 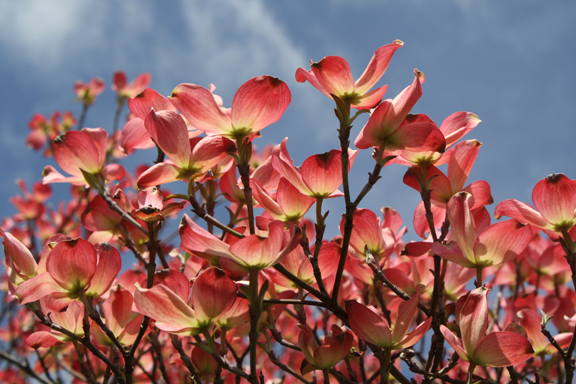 “A dogwood right in that corner.” I’ve said that directive to my husband re: our front lawn so many times that even my 3-year old points them out when we’re driving and says THAT’S the tree we need in the corner of our lawn. I’ll forward him this post and get moving on the dogwood plan 🙂 Beautiful. beautiful Wendy – that tree has the same disposition as its owner . . .
What a gorgeous tree and perfect reminder to take time to be present in your day. What wonderful sentiments to go along with such a stunning tree. Absolutely perfect. Absolutely sweet. Oh Wendy…I just love your posts. You always brighten my day. You, my friend, are the one with the sweetest disposition and one of the kindest hearts I ever did meet. So proud to know you! And you certainly have a sweet disposition, just like that beautiful tree – you are an inspiration my sweet friend. Truly beautiful…just like you! Thanks Wendy for making me smile. How sweet! Your photos are gorgeous, and I am longing for spring. Such beautiful photos! Your post made me feel relaxed and happy. Thank you for sharing! Thanks for the ray of sunshine today, Wendy. 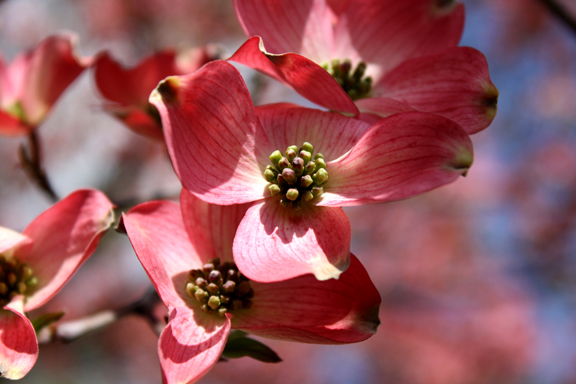 We have a dogwood outside our window and I love to watch it bloom. 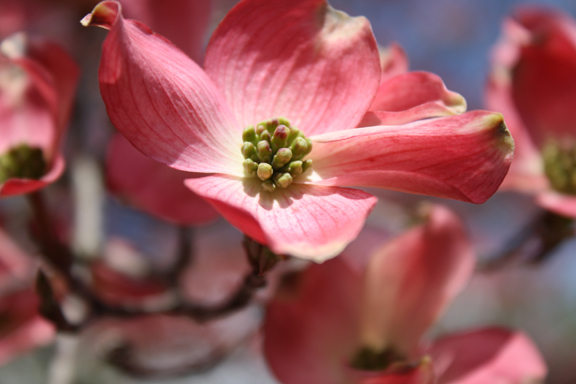 Your pink dogwood is spectacular (and so are the photos)! Beautiful blog and beautiful pictures! I’ve scanned all around your site and will be back. You are wonderfully talented!! Your heartfelt sentiments are the perfect compliment to these stunning photographs. Delicate yet so powerful. 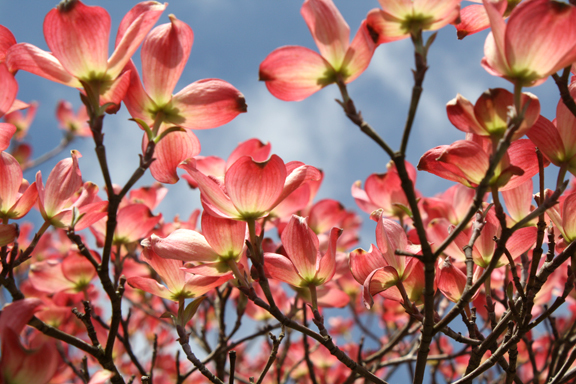 Spring has been wet and cold here and I was so delighted last week to see that my garden is finally starting to sprout and the tiny buds are bursting forth on my magnolia tree. There is nothing like seeing fragile green buds working their way up and out from the ground after a long harsh winter to remind one that through adversity comes great strength and beauty. It’s been nothing but gray skies and rain here, but this post made me smile. Such gorgeous photos!